"Its not a car its a Karmann Ghia"
That is horrible news. Will keep a look out for it. Unless the traffic department moved it? If it was in a dangerous spot they would do that. Hope he finds it soon! pay as you never get cought assuming it was stolen. This is the first time in months I have been able to log in,just hope it gets posted.Good luck hope he finds it. I contacted Ndabeni Traffic Impound. They checked their records and no VW beetles have been towed by their services. Maybe check a few back yards around there if possable. It it was towed away then things look bleek! Have you guys done a door to door inquiry, to see who saw what. That will tell you where to look. Just remember, "Some one is always looking", Old cop saying. Do some effort, and you will find it. Flying over the city and some townships tomorow morning in cessna... will keep my eyes open. Nice! Please share more details of the beetle. I have had my 1967 German manufactured Beetle stolen from a private garage that I had rented for its storage, here in Durban. This happened sometime in 2014, when I realized that the building had changed ownership and that all garages in the complex had been converted into apartments. I managed to trace the new owners of the building but they claimed that when they purchased it, the apartments where already in place. Further, they claim that they do not know who carried out the alterations. I suspect that whoever forced opened the garage is likely to have taken possession of my Beetle. I have all papers and continued paying for its Road Licence Renewal in the hope that, sooner or later, something will happen (i.e. a Traffic Fine) leading to its recovery. Would it help if I list the VIN and Engine numbers for the purpose of getting assistance in finding it ? Last edited by Ticky on Mon Apr 08, 2019 7:05 pm, edited 2 times in total. Thats a bad issue right there. Have you reported the car stolen, so that the vin can be placed on the stolen list.?? If I was you, I would place photo's and vin number as well as any distinguishing marks or dents on each and every VW forum, here and overseas, as well as other car forums. Thats the only way someone will spot it and contact you. Good Luck with your find. Last edited by retrovan on Thu Apr 04, 2019 10:29 pm, edited 1 time in total. Thank you for your suggestions and good wishes. I bought this German manufactured 1300cc Beetle, 2nd hand and, it was in immaculate condition, with no visible scratches or dents. 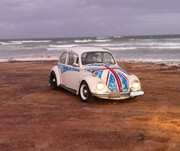 I'll post a full description of my Beetle soon. Contact all the shipping agents to see if they got any Beetles going overseas or that will be going. Good luck.